With artistry, precision, and painstaking attention to detail, Bassett’s finest craftspeople with expertise in making benchmade furniture create pieces by hand. One at a time. Literally. As a matter of fact, the entire Bench*Made line is made old school, in Bassett, Virginia where Bassett started making hand crafted, high quality furniture back in 1902. For Bassett, a handcrafted furniture company offering real furniture from America - local skilled artisans, simple tools, enduring construction techniques, and time-honored woodworking benches (where the term “bench made” comes from). Most other hand-crafted furniture makers can’t say this. Exceeding every expectation and excelling by every measure isn’t easy. Every piece of this furniture made in the USA is custom crafted from either solid red leaf maple or varieties of solid white or red oak. The timber is harvested from sustainable forests in the Appalachian region, specifically Tennessee, Kentucky, West Virginia and Ohio. For every piece created, Bassett returns to the region and plants two trees. That’s about 60,000 trees and counting. What other hand-crafted furniture store can make this claim? This unyielding commitment to sustainability and to supporting the environment gives everyone a little peace of mind. 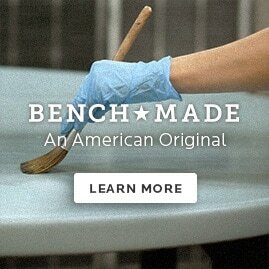 Bench*Made handmade high-quality furniture is substantial, built to last a lifetime, and then some. Artisan dining, bedroom, tables and storage are also wonderfully customizable with a range of finishes (16 for maple, 8 for oak), 5 hardware options, and over 800 fabric and leather options. This multitude of design options offers a versatility that speaks to many lifestyles. Bench*Made Maple hand crafted furniture finishes include 9 wood tones in medium to low sheen, 2 weathered finishes, and 5 painted finishes. Bench*Made Oak is available in 2 finishes and wire-brushed to open up the grain and allow the finishing material to amplify the textural effect. For each finish, a variety of stains and glazing materials are applied in multiple steps to build the color and accentuate the grain patterns. The final top coat on all finishes is a catalyzed conversion varnish that cures the finish in a way that’s far superior to conventional drying ovens and lacquer top coats, protects the solid wood artisanry from the harsh heat, and provides outstanding protection. Visible knots, voids, and insect markings are nature’s signatures, enhancing the beauty of the wood.